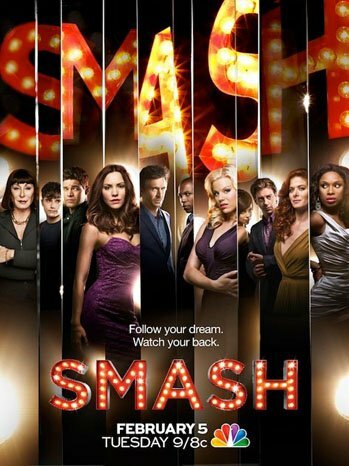 I watched the preview of the pilot for the new NBC drama Smash, the much-hyped series about the making of a Broadway musical about Marilyn Monroe. I hope to blog about it each week as new episodes air, but these are my initial thoughts about the pilot and concept itself. Positives–I am a self-confessed theatre geek, so anything about theatre is going to get me watching, at least at first. I also love that they’ve put in some references to shows, performers and writers that real Broadway buffs will recognize. I also like that it shows the development of the show from the ground up, taking us through the whole process, from writing to demos, to finding a producer (Anjelica Huston) and director, to casting and (in upcoming episodes) workshops and rehearsals. Also, I like the focus on two common “types” in the running for the role of Marilyn—the Broadway ensemble member who dreams of getting a lead (Megan Hilty as Ivy Lynn), and the complete newcomer who waits tables while auditioning and hoping for her big break (Katharine McPhee as Karen Cartwright). The characters seem interesting, if not fully developed yet (it’s only a pilot)–the snarky, randy British director (Jack Davenport), the playwright/lyricist (Debra Messing) who is trying to juggle a career and family, Karen’s too-perfect boyfriend (Raza Jaffrey), and more. I love the interaction between Messing and Christian Borle as the composer. I loved the musical numbers, and the very New York vibe to the show. Actually filming in the Big Apple definitely adds to the authenticity of the show. Reservations—Some of the plot elements are very obviously Hollywood trying to do Broadway and seem contrived to hold the audience’s attention–the “private meeting” at his apartment that the director calls with Karen, the book writer’s family issues, the composer’s grudge against the director, the producer’s big messy divorce, etc. It seems like all the players involved have a whole lot of heavy personal drama in addition to their work on the musical, but it’s TV and that’s what TV shows do. I’m OK with all of that if the story holds my attention. I do wonder, though, that even though I love all the Broadway insider vibes, if those might turn off casual viewers who don’t follow the theatre world closely. I hope it will draw more fans to musical theatre, but the jury is still out on whether it will. I also don’t know if I buy all the “she’s an undiscovered STAR” hype they’re building around the Karen character. The ads I saw during the Super Bowl were about Katharine McPhee as much as they were about the show, with Megan Hilty barely getting any screentime. McPhee is a very good singer and I remember that I wanted her to win her season of American Idol (back when I still watched it), but Hilty as Ivy is excellent as well, even though the show definitely seems weighted to get the audience to support Karen over Ivy. From my perspective, though, Ivy seems better suited for the part from the outset and seems more of a complete performer (singing, dancing and acting) than Karen has been shown to be. I do like that it’s not a black-and-white “hero vs. villain” angle, though, and both characters are sympathetic in their own ways. We will see how it all unfolds, and I will definitely keep watching. I hope this show will catch on with the general public enough for a full season, and I look forward to seeing how the story develops. Let’s see if Smash really will be a smashing success.